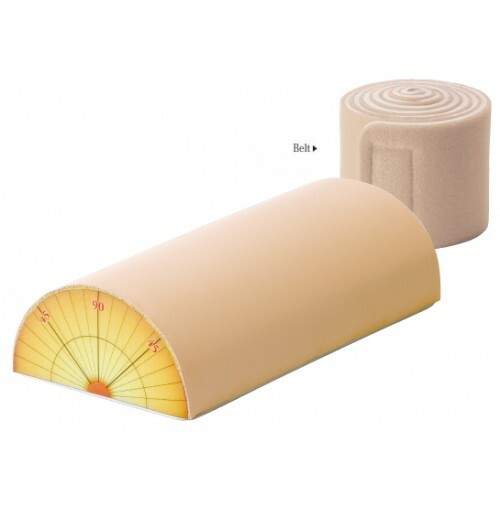 This training pad is suitable for acquiring basic skills of acupuncture. "perpendicular insertion", and "oblique insertion" to polish your skills. The skin is made of a special material that leaves no needle mark even after countless practice. This is an optimal size training pad for mastering the assisting insertion skill with non-dominant hand, and moderate elasticity gives a sense of adjusting skin surface pressure. Trainees can also practice perpendicular insertion or oblique insertion by confirming the angle with semicircular protractor displayed on the lateral side of the training pad. Trainees can attach the pad to any parts of the body using "hook and loop fasteners". Pair practice facilitates a realistic needle insertion practice in actual posture. By acting "patient", you can experience the anxiety about receiving treatment and also understand the needs of psychological consideration. Not only the Japanese style (insertion tubes are used) but also the Chinese style acupuncture (insertion tubes are not used) can be practiced. The practice of needle insertion by confirming the angle with semicircular protractor displayed on the lateral side of the training pad.